It is a cool Sunday morning at Kanyawegi Village, Kisumu. Women, children and men are busy going about their business; some trekking to the market while others ride on motorbikes to church. Vitalis Oguom's home is buzzing with activity. Scores of elderly people are gathering at his quiet home. Usually, this would mean he is just about to mediate a land dispute or family feud. 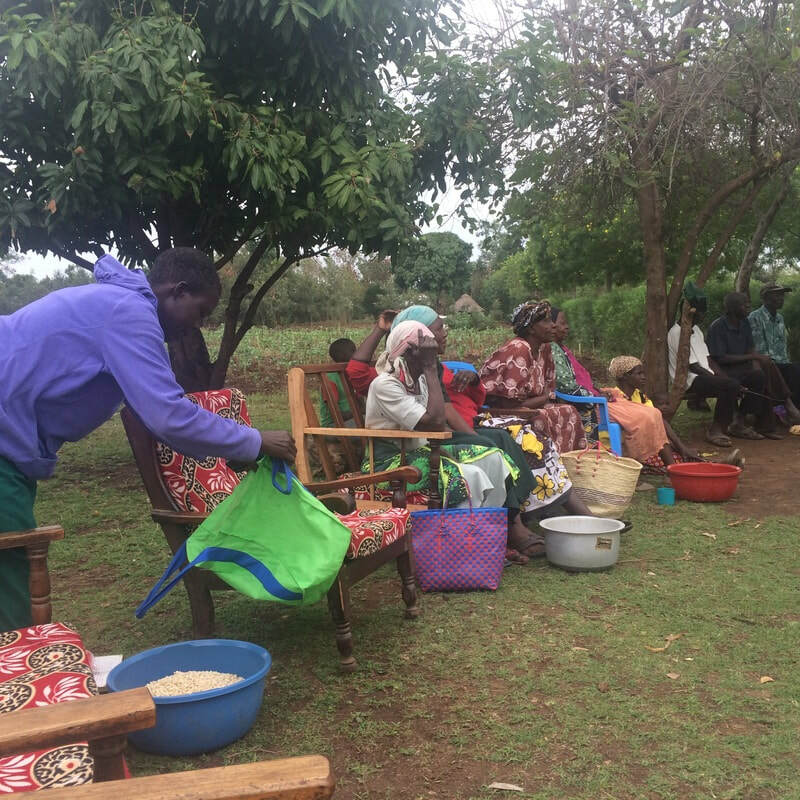 But today, having recently received a Pollination Project Flow Fund (www.thePollinationProject.org), Vitalis has invited the senior members of the community living in poverty to give them food. I'm surprised at the many people gathered in his compound. I check my watch to find out how late I am for this function. Vitalis had invited me to participate in distributing food to the villagers at 8.am and for a moment I thought I was Kenya time (late). 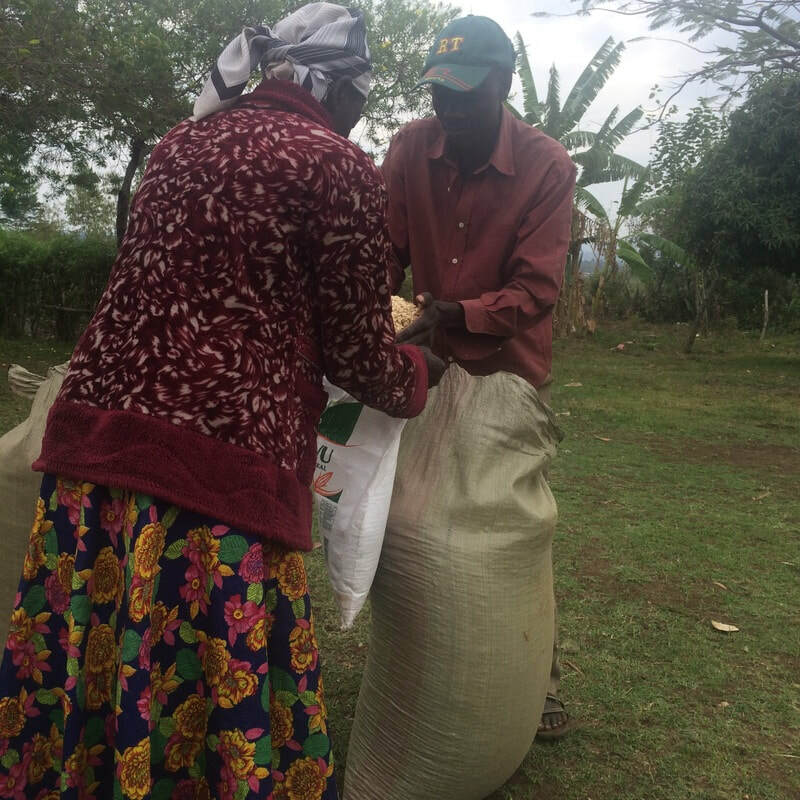 We exchange greetings and Vitalis goes about his business of distributing the maize. 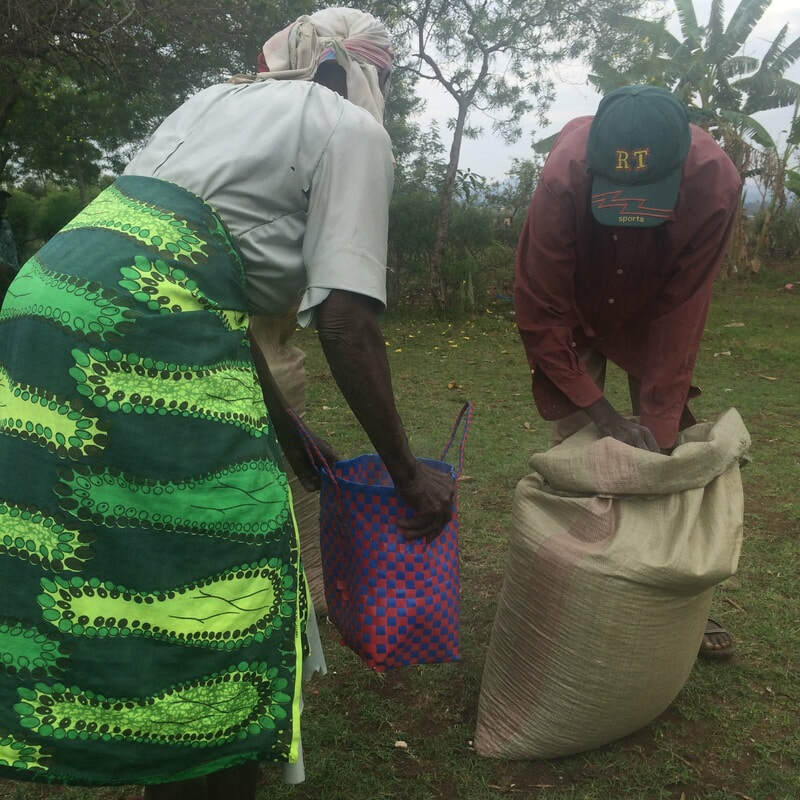 I quickly notice an old woman struggling to stand from her seat and then unsteadily walk towards Vitalis, Her basket is wide open, ready to receive the grains that will enable her to kick out hunger from her home for a few days. She gets her share and how priceless it is to see her face brighten with gratitude!! Vitalis had told me earlier that the women and men he supports with food from his farm are those not enrolled in the cash transfer program administered by the government. "David, this is Teresia Omollo. She is about 65 years old and comes around here. She didn't know her exact date of birth when she applied for her national identification card, so the officials reduced her age by 5 years. Therefore, she doesn't qualify for the cash transfer program,'' Vitalis informs me. There are more women like her down here who couldn't walk here to get their share. I''ll deliver it to them personally later," he adds. I can't help wondering why not knowing her age should condemn Teresia and other elderly members of the community to a life of poverty. I leave Vitalis to continue doing his work, a BIG smile on my face knowing that he is there for Teresia and other elderly people living in poverty. He will help Teresia to get food and eventually enroll her into the government program and connect her with the support system she needs. Indeed, empowering marginalized grassroots leaders like Vitalis with flow funds is a game changer in helping to build community resilience and ensure access to a more equitable share of the world's wealth.